Amazon deals: Save up to 40% on Echo smart speakers and Fire TV streamers | What Hi-Fi? Spring has officially sprung, and to mark the occasion, Amazon has officially kicked off its spring sales. There are savings to be made across a wide range of products, including TVs, soundbars and headphones, but it wouldn't be an Amazon sale without price cuts across Amazon's own hardware. 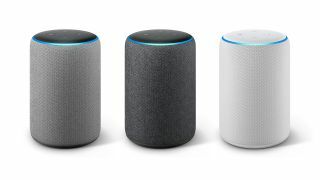 Amazon has slashed the prices across virtually all it's smart speakers and streamers and there are some great deals to be had. The Amazon Echo Dot (3rd Gen) is down from £50 to £30, the Amazon Echo (2nd Gen) is now £65, down from £90, the Amazon Echo Plus (2018) is down from £140 to £110, while the price of the Amazon Echo Input has been slashed from £35 to £20 - that's a saving of over 40%. Switch over to Amazon's Fire TV family of streamers and there are similar discounts to be had. The Amazon Fire TV Stick 4K is now £35 (down from £50), while the standard Amazon Fire TV Stick with Alexa has been cut from £40 down to £25. It's not just Amazon hardware that's in the offing, either. Amazon is also offering three months of free Amazon Music to new subscribers who sign up between now and the 19th April.